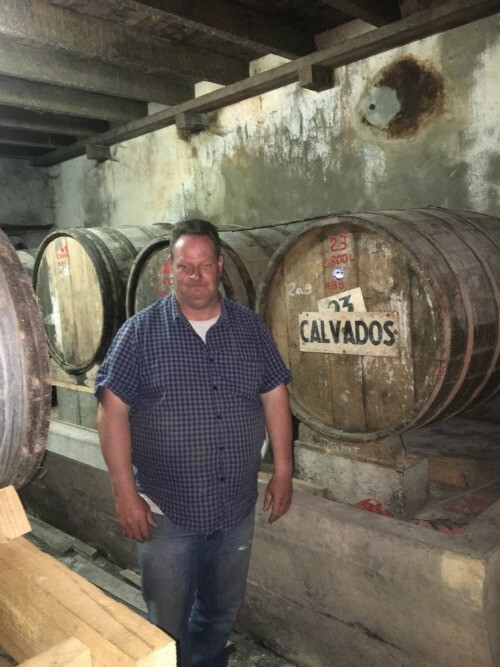 Among the 500 or 600 cider producers in the region of Normandy, France, Philippe Lecrivain doesn’t necessarily stand out, yet his operation is a gem and a success that would be the envy of many a North American cider maker. Philippe grows his own cider fruit as well as ferments his cider and manages bottling and distribution. This is possible because of his roots as a second-generation cider maker. Historically, Lecrivain’s father was instrumental in having cider included in the list of products identified as AOC (appellation d’origine controlée), recognizing it as a French product of distinct terroir. In a very small town called Brée (imagine roughly 10 lovely, garden-encompassed homes on a country road), and across the highway from his tasting room, Philippe gave us a tour of his operations. 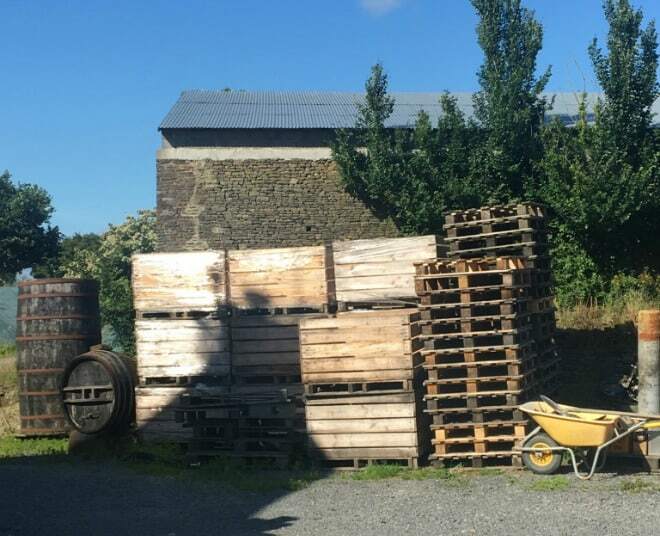 His cider-making buildings line the other side of a gravel courtyard from his home. While he greeted us, a black Lab and Philippe’s 20-something son also approached to say hi. Gruffly, I might add. Clearly, these are not people accustomed to entertaining tourists, and I had to encourage them with how very grateful we were for access. Philippe was at ease, though, because my aunt is a long-standing resident of the same town, and he was soon chatting about his latest news, that he is going to move his tasting room over onto this location, and shows us the large new press he leased this past spring. This conversation happened in French, mind you. One doesn’t encounter a lot of fluent English speakers in the region. 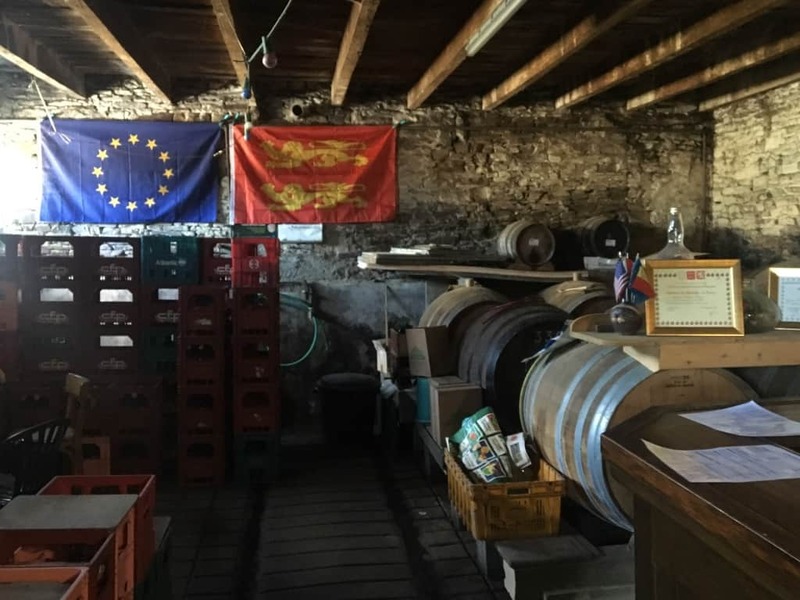 Philippe commented about the percentage of the lease that was funded by the European Union and worries about British cider makers in the wake of the Brexit vote. Inside his approximate 3,000 square feet of production space he also showed us a room of fiberglass cider tanks, which he prefers over steel, and lovely oak barrels for aging that are actually now often made and imported from the United States, he told us. Le Pressoir du Mont is the name given to this company that Philippe owns and operates with his wife and his brother, François. 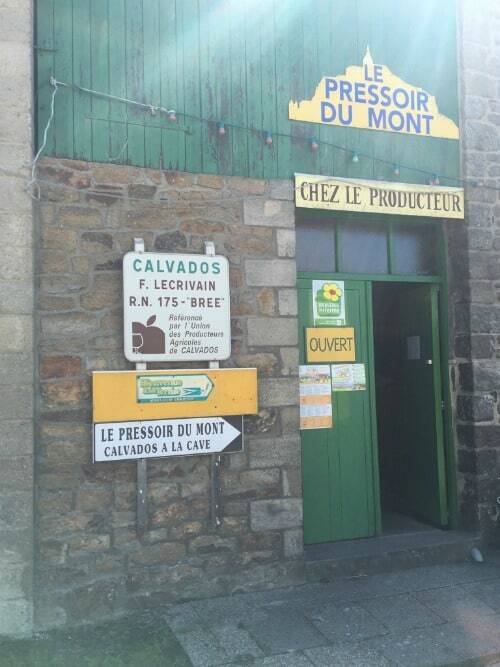 The “Mont” in the name refers to the company’s proximity to a famous French tourist destination, the Mont-St.-Michel. 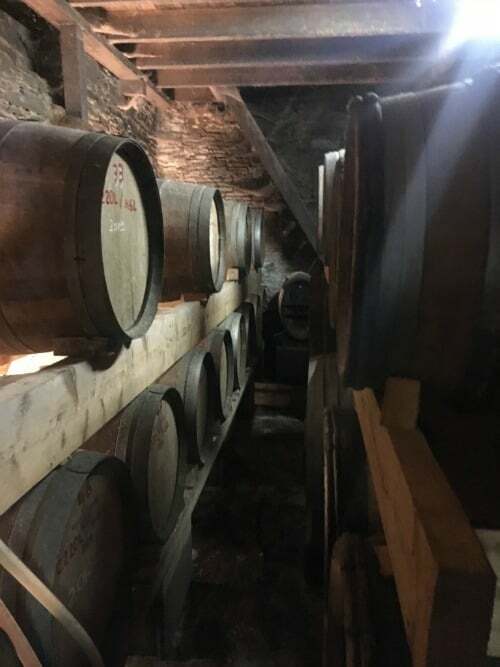 The company belongs to the Association Cidricole Normand (ACN) and has received many awards over the years by participating in regional and national cider contests. 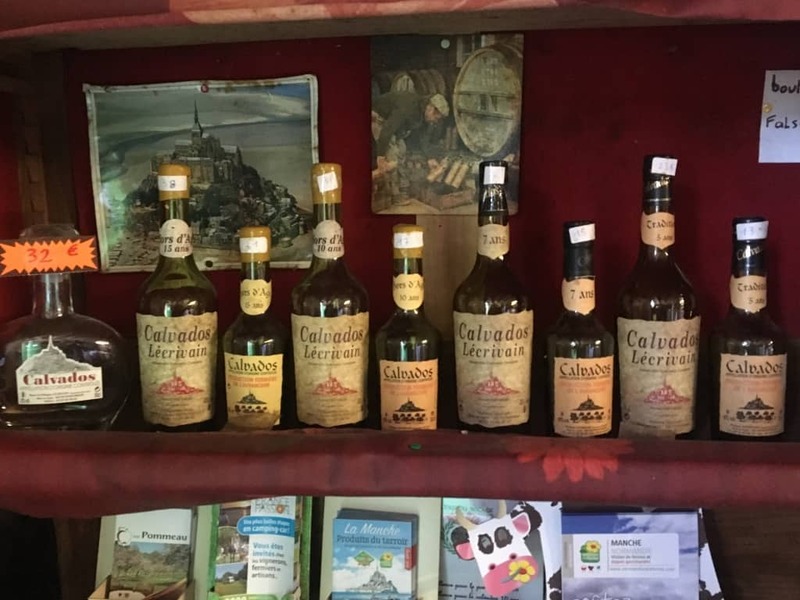 For example, the company is a past winner of the “Golden Apple” (Pomme d’Or), awarded in the Contest of Products “Cidricoles.” Perhaps its most consistent winner is the Calvados aged 10 years. With 17 acres of orchard, Philippe produces 18,500 gallons of cider per year, as well as Calvados, Pommeau and apple juice. In his orchard operation, all harvesting is done by machine. Philippe said he might rather have hand-picked fruit because the fruit fares better, but labor shortages have required him to automate. Among the many cider apple varieties grown are very local varieties such as Grollon and Coutigny. Then there is also the local variety that has fallen out of favor because of being overly precocious: Belle Fille de la Manche. His current superstars, for flavor and annual bearing, are Noël des Champs, St Martin and Moulin à Vent. He also fondly mentions Avrolles, which is very acidic and great for Calvados. He goes on to list Bisquet, Mettais (high concentration of sugar), Bedan and Petits Jaunes. To those of us accustomed to a dearth of heirloom cider apple varieties in many parts of the United States, it is an embarrassment of riches. We said goodbye reluctantly, waving as we squeezed into our rented Fiat 500 on a beautifully sunny summer afternoon. After all, Philippe was a gracious host and gave us a glimpse of a world-class operation and an extremely hard-working family, devoted over generations to cider. Le Pressoir du Mont is located at Brée en Tanis, RN 175, 50170 TANIS, France; phone: 02.33.60.06.33.